Above is Howdy’s eye on day 0, this Sunday, the day I brought him home. 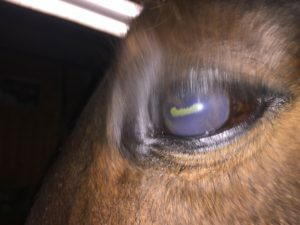 His pupil displays miosis – constriction. I learned this week that horse pupils are rectangular or a bit oblong oval unlike human eyes and I’m slapping my forehead that I never gave that much thought. At any rate, here we can see that his pupil, the sort of yellow area, is nearly constricted to a single line. A very hopeful breakthrough on day 3. Not entirely open, but much better! Meanwhile, I’ve been reading a lot about club foot, here, here, here and here; as Howdy is slightly clubby on his right front. Today my farrier came out and had a look at him. This, after I had emailed him and asked him for his opinion on the wisdom of buying a horse with a club foot. He said, “I do a fair number of them. They’re not my favorite, but they do pretty well.” So, my farrier arrived and looked at Howdy and shared that he was not very concerned about his hooves. (This is a good thing indeed!) He said he thought we could work with them without much trouble and he had a lot of horses in work with worse clubs than Howdy’s. Glorious joy to hear!Howdy had a trim. Here are before and after photos. Monday in the stocks at ISU. The right hoof (on the left side of the picture) is the one with the slight club stance. The blue line highlights the broken line between the leg and the hoof wall. The left leg has a more correct line. Today after the trim. The leg/hoof line on the right leg is much better! I like it a lot, and I hope he does too. Care must be taken not to produce too much change in the hoof angles because of course that affects the bone column of the leg. We’ll watch and see how he does! All very interesting. Thanks for sending it. He is a handsome dude.